Most 3D displays use a variety of methods to trick the brain into thinking it's seeing a three-dimensional object. These usually involve showing slightly different images to different eyes. But now, optical engineers led by Yoshio Hayasaki at Utsunomiya University have developed a new kind of display that generates 3D images in a liquid. Instead of rendering a 3D scene on a flat surface, the display itself is three-dimensional - or "volumetric", as scientists call it. Like all the best things in the world, it requires lasers. 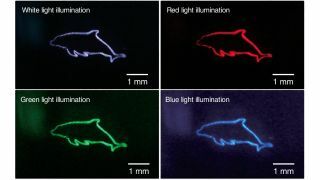 Specifically, it requires lasers that can create incredibly short pulses of light. The lasers are focused at a specific point inside a thick, viscous liquid, where the photons are absorbed and create microbubbles. Illuminating those bubbles with a projector can then make them appear as different colors. The result is a true three-dimensional display, viewable from any angle without 3D glasses or headsets. It's thought they could be used in art or museum exhibits, where the viewer can walk all around the display. It could also be used to help doctors visualise the inside of a patient before surgery, or for the military to inspect terrain and buildings. So far the researchers have tested the display by creating a sequence of images - a 2D picture of a mermaid, a 3D rendered bunny and then a 2D dolphin in four different colours. Contrast can be changed by altering the number of laser pulses used. But there's one problem that needs to still be solved - the bubbles stay put and don't go away. The team is working on a system that would use a stream inside the liquid to burst the bubbles, allowing them to be cleared. "The volumetric bubble display is most suited for public facilities such as a museum or an aquarium because, currently, the system setup is big and expensive,” said Kota Kumagai, first author on a paper describing the technology, published in the journal Optica. "However, in the future, we hope to improve the size and cost of the laser source and optical devices to create a smaller system that might be affordable for personal use."